Goodes USB 3.0 Front Panel allows you to convert an unused 3.5" floppy drive space into 4 USB 3.0 ports and directly access to SuperSpeed data transfer rates of up to 5Gbps. Transfer videos, music, photos, and data files between USB devices and your computer at blazing fast speeds. 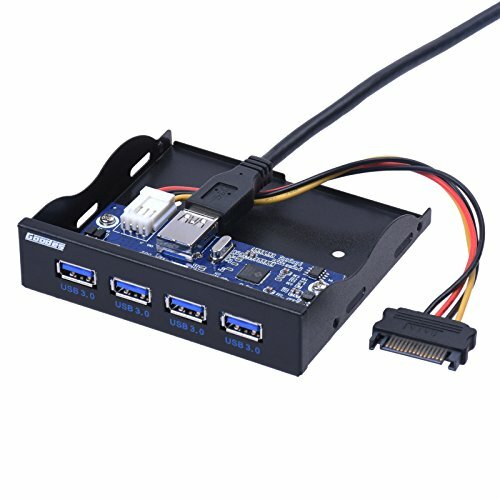 For using the USB 3.0 port, an external USB 3.0 port at the main board or a USB 3.0 PCI- extension card is required. This drive only has screw holes on the side. If your case only has the screw holes for the bottom of the drive, this drive will not be screwed in. If you have any questions about this product by Goodes, contact us by completing and submitting the form below. If you are looking for a specif part number, please include it with your message.